Our annual ‘Easter Buffet’ is taking place on Tuesday 20th March at 7pm. Join us for yet another sumptuous feast (we know you wouldn’t expect anything less!). This year, our guest speaker is Pete Campbell from Penrhyndeudraeth. 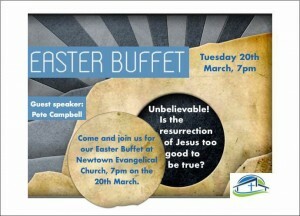 Pete will be speaking on the theme of the Resurrection. If you’d like to join us, please get in touch as spaces are limited.